Bovenbouw Architectuur renovated three nineteenth-century buildings in Antwerp’s central street, Leysstraat, for residential use in an area that had become purely a shopping district. Bovenbouw uses a delicate touch on a historic building. Appointed by AG Vespa, the developer who purchased the buildings at nos. 7 and 15 Leysstraat, Antwerp, Bovenbouw Architectuur came up with an attentive renovation project for functional conversion of the spaces for residential and commercial use. With heritage status since 1971, the three buildings had façades in traditional nineteenth-century eclectic style and an internal layout that would have been hard to sell on the residential market. The first two levels were already occupied by shops fully integrated into the new spirit of Leysstraat, which has become a lively shopping street, completely altering its image in recent years. The Belgian studio complied with the requirement to preserve the façades, and the only work done on the outside of the buildings was restoration of their original condition. 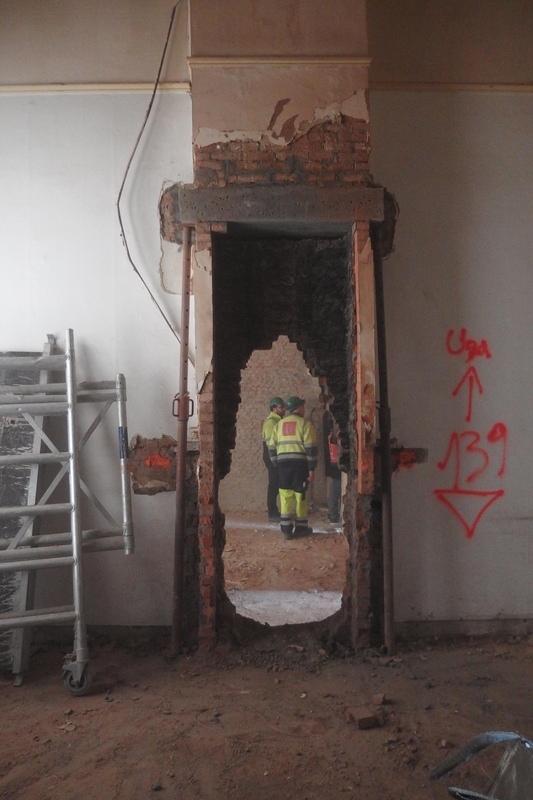 Inside, however, the renovation project significantly changed their layout and the functional relationship and interaction of spaces, with demolition of old walls and doors and construction of new ones, a new skin and new structural fixtures. They created a total of eight apartments, in addition to the two shops on the lower level. 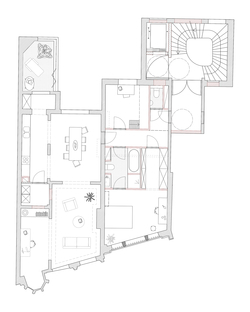 The apartments have one or two bedrooms and vary in size from 101 to 120 square metres. One of the details that most impressed the architects’ sensibility was the presence of fireplaces in many of the rooms on all levels. This functional and decorative feature, essential at one time, but unused today, was in some cases transformed into a sort of fairy-tale passageway to another room (something like Alice’s looking-glass), altering its proportions to the point that its original function is no longer apparent. 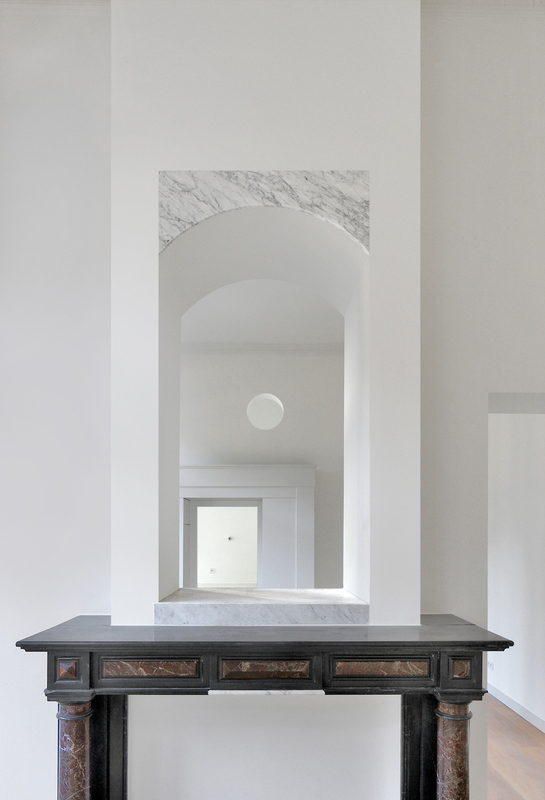 The fireplace becomes a monumental portal, or is enlarged to create a wardrobe shared by two rooms, like the one connecting the living room with the kitchen and containing all the kitchen utensils. Or it is used to create an image, covered with marbles recalling the original colours and materials, opening up a window in its hood to communicate with the adjacent room. This operation is underlined and value added to it by covering the door jamb with marble, a detail repeatedly underlined in the doors as well, where it is underlined with wood. 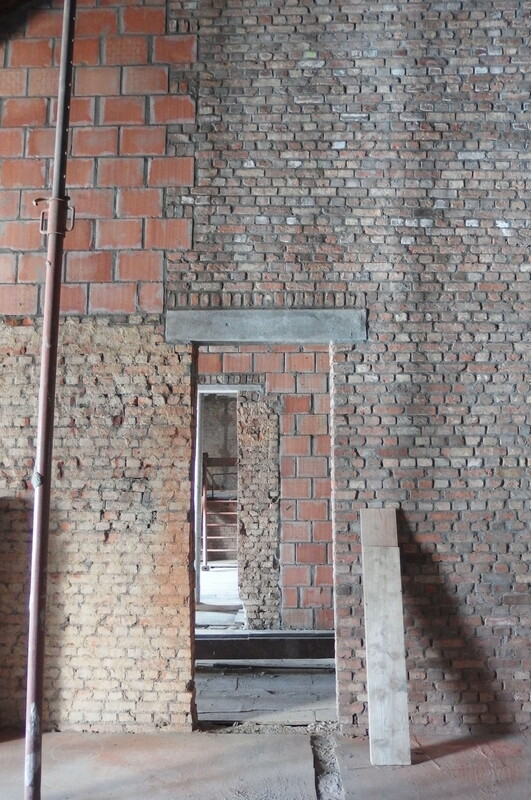 The renovation project reduces the distance between the big spaces at the front of the buildings with the less noble one in the back, opening up unexpected views between them. This meant opening windows in the hoods over the fireplaces, in some cases, or making tall, round openings. 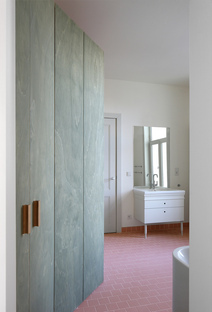 The oblique cuts in the rooms are exploited with custom-designed floor-to-ceiling furnishings: in one case, the bathroom door opens onto a multi-door cabinet painted antique blue, concealing the shower. The divider walls created to break up larger spaces which are difficult to use and create new bathrooms add new perspectives. White plaster mostly eliminates the previous scanning of the interior space and creates a mute background shared by all the apartments. But inclusion of circular windows or arches and association with the accents created by coloured marble represents a nod to the eclecticism of the buildings’ historic façades. As the bathrooms were a new addition, they had to fit into passageways such as stairwells or symbolic spaces such as a spire on the façade, in an alienating process somewhat like that applied to the fireplaces. The design of the kitchens, as big items of furniture, is appropriate for the building’s original monumental style, with friezes and moulding inspired by that of the pediments and mullioned windows on the buildings’ public façade. Lastly, an attic apartment was created, using an area which was not considered noble and therefore has lowered, slanting ceilings. The buildings’ previous history is not denied, but underlined, leaving the rough brick of the walls and the beams and strips of wood of the roof in view, painted white, the basic colour used throughout the renovation project. Height at the roofline permits creation of a wooden loft from which to admire the view through the skylights.